Showcard Print has become one of Europe’s largest manufacturers of point-of-sale printed material, supplying the UK’s biggest retailers and readily recognised brands. The business offers a comprehensive range of large print formats across litho, digital and screen solutions, together with sophisticated 2D and 3D finishes. Its customers demand exacting standards on production quality, fulfilment accuracy and the ability to meet short deadlines; therefore having the highest quality materials handling equipment is vital. Having the right partners to support the forklift truck fleet was considered of critical importance to the business. Showcard Print has had a successful relationship with Rushlift for 17 years, so when it came to reviewing the contract on its forklift truck fleet the business has every confidence in Rushlift’s ability to support the operation over more years to come. “The main thing for us is reliability. Downtime is time we just can’t afford to lose, so we need a good, strong, reliable product. 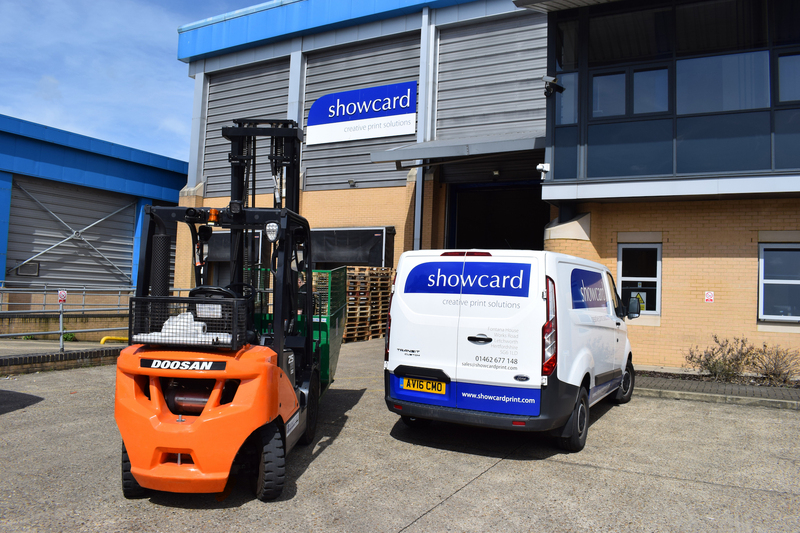 Our forklifts get a lot of use, but over the years we’ve had very few problems with the Doosan trucks – we can ask no more than that,” said Gary Woods, Operations Director at Showcard Print. Rushlift upgraded Showcard’s fleet with Doosan’s latest counterbalance models from across its electric and diesel powered ranges. There were four counterbalance trucks specified – three electric and one diesel. The new Doosan D25S-7 2.5 tonne diesel counterbalance truck was selected to replace a gas-powered model, owing to its high performance and low-emissions. And three electric models – a B18X-7 1.8 tonne four-wheeler, a B20T-7 2 tonne three-wheeler, and a B20X-7 2 tonne four-wheeler – were provided along with extra batteries, auto-fill and a Fronius charging system, for efficient operation and power availability over a long three-shift operation. Of critical importance is the ability of the vehicles to handle product and materials carefully, avoiding scuffs and damage to the finished display cards. Health & Safety was another important consideration for Showcard Print. All vehicles were supplied with blue light projected pedestrian warning lamps, flashing lights and speed limiters. Other extra features added to the trucks were auto tilt levelling, side-shifting fork positioners and rear LED spotlights.